On Friday I attended meetings of the Joint Fora on Service Support and Service Delivery of Tayside Fire and Rescue Board. This was a very interesting meeting which looked at the future work of the Fire and Rescue Service. We discussed the plans for the forthcoming consultation on Towards a Safer Tayside. There was a very interesting discussion on how the Fire and Rescue Service would benefit from better information sharing amongst the public sector. I will be asking what the City Council can do to make information available to the Fire and Rescue Service. It is important that we try to do all we can to allow firefighters to fight fires effectively, to prevent fires where possible, and that where possible sharing information should take place. The next full meeting of the Fire and Rescue Board will respond to the current consultation on the Scottish Government's proposal of a single fire service for Scotland. I was pleased to read in tonight's Evening Telegraph the views of the Roman Catholic Church's representative on the Education Committee, Mgr McCaffrey, he made his views clear on the need for bus services between the West End and St John's High School. Monsignor McCaffrey's views are outlined below. For myself, I am clear that the underlying factor in the problems faced by St John's pupils trying to get from the West End to their school and back is that bus companies are under no obligation to operate non-profit making services. Both bus companies in Dundee can focus on profitable routes and they do not have to provide a social service to anyone. This is a legacy of bus deregulation implemented in the 1980s. I think that this issue along with a number of other issues, such as the inability to go by bus from parts of the West End ward to Lochee High Street, make the case for more regulation of buses. I think that in return for licences to run profitable services there should also be an obligation to provide socially useful services such as a service to St John's and services for many areas with an elderly population. The City Council, though, needs to act and find a solution for those pupils who are at St John's just now. These pupils generally live within the catchment area of the school, they generally attended one of the feeder primary schools for St John's, namely St Joseph's Primary. The lack of an adequate bus service is making many parents question whether they would want to send their children to St John's. To replace the number 4 service which National Express Dundee withdrew the City Council replaced this with a subsidised bus service the number 204. This service does not include services to St John's at the beginning and end of the school day. The Education and City Development Departments should look at this issue. Susidised bus services run to St Paul's Academy, as the council report from June points out, and parents of pupils at Harris Academy have rightly been promised that when the school decants to the Rockwell site during the rebuilding of Harris Academy that buses will be provided from the West End, and elsewhere, to the Rockwell site. I do not see what the difference is here. Parents and pupils at St John's should receive the same consideration. I am pleased that my colleague Jenny Marra MSP, herself a former pupil at St John's, has made clear her support for West End parents who are concerned about getting their children to and from St John's High School in a reasonable time. Along with my colleague Jenny Marra MSP I have called for the proposed single Fire and Rescue Service to be based in Dundee. I previously made this call at the Tayside Fire and Rescue Board meeting in March. The case for a single service being headquartered in Dundee is strong in my opinion. It is important that if there is a single fire and rescue service that the message is sent out loud and clear that it is not about centralisation in the central belt. Dundee would be a great location as it is within easy reach of the majority of the Scottish population. Tayside Fire and Rescue already has a headquarters building in Dundee and I am sure that this could be utilised. Labour only supports the single fire service as long as the savings are re-invested in frontline services. If you want to read the Scottish Government's consultation document on the single police and fire services it can be found here. On Tuesday evening I was sorry to miss the September meeting of the West End Community Council in order to attend the Annual General Meeting of Blackness Primary School Parent Council and PTA. It was great to hear about the work which the Parent Council has done over the last year. There has been a large amount of work done in areas such as travelling to school and road safety. The PTA had been able to assist the school in a number of material ways through fund-raising. It is great to see parents who are prepared to play a part in ensuring that their children's school is supported. Well done to everyone who plays an active part in the life of Blackness Primary School. Today I joined council colleagues and council officers at a briefing on Winter Maintenance. This briefing was a response to problems from last winter. I welcomed the opportunity to hear about the lessons which have been learnt from last winter and about new thinking for next winter. 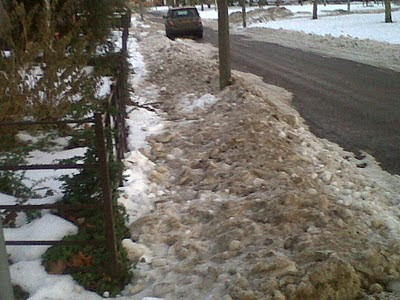 Last winter was obviously extremely bad and in late November and December there were severe problems with snow and ice right across the city. Labour called for a review of what happened last year and it was good to hear that lessons have been learnt and that new approaches will be tried. Once again I would like to pay tribute to the hard work of council staff last winter who often went the extra mile for their clients. I look forward to the council's new proposals being presented to committee at the end of the month. Hopefully we will not have as severe a winter as the one we suffered last year but if we do I hope that the council will be better prepared this year. On Monday evening there was meetings of the City Council and some of its committees. The City Council started with a presentation about the work of the Dundee Youth Council, especially their work with Dundee's twin cities. It is important that elected members listen to the views of young people. At the Environment Committee I joined in congratulating the staff of the council for their work at the Dundee Flower and Food Festival. The Flower and Food Festival is a partnership between the public, private and voluntary sectors. It is a great event for all the family and brings large numbers of visitors to the city. The event is anchored by the work of council workers. The festival would not happen without the hard-work and commitment of public-sector workers, it shows the public sector at its best. At the Policy and Resources Committee I spoke on a number of issues. I was really pleased to see that the Administration were re-committing to a policy first implemented under a Labour Administration of free access to council sporting facilities for elite athletes. It is important that we do all that we can to ensure that we assist Dundee-based elite athletes have every opportunity to win medals with the British or Scottish teams at the Olympics and the Commonwealth Games. I think that if we promote elite athletes we will also do a lot to encourage participation in sport. I was pleased that my colleague Kevin Keenan was able to get a reassurance that in a report on 'Proposed Sustainability Energy Partnership' with Scottish and Southern Energy there was no link to the proposed Biomass plant. The Leader of the Council said that the statement at paragraph 4.5 of the report 'could not get any clearer'. So we have a reassurance that there will be no infrastructure included in these proposals which is linked in any way, shape or form to the proposed biomass plant. There was a report on a Review of Welfare Rights, the Labour Group welcome much of what was in this report. We are concerned that given changes being implemented by the Tory-led UK Government there will be much more need for welfare rights work. I was pleased that there was at least some attempt to work across parties when the spirit of our amendment calling for the welfare rights organisations in the city work together to give the most help to people in need. There was also a report on a review of the education service delivery model. The Education Department will be remodeled and headteachers will be included in management of the department to a greater extent from now on. This report was based in many ways on an external report, senior officers of the council and the administration were keen to keep secret. The report when you read it really does beg the question what were they trying to keep secret? The Administration deferred consideration of a report on discretionary spending by departments. In these straightened financial times when every penny is a prisoner it is strange that officers can spend up to £2.5 million per annum on spending which does not have to be reported to council. The Labour Group are looking for greater detail so that all spending can be analysed in a systematic manner. On Monday afternoon I attended a meeting of the Health and Safety Committee of Dundee Ice Arena. This was a very interesting meeting. The Ice Arena is a great place to visit, please take a look at the arena's website to see what is going on. This Sunday Dundee Stars will be taking on the Sheffield Steelers in the Elite Ice Hockey League.